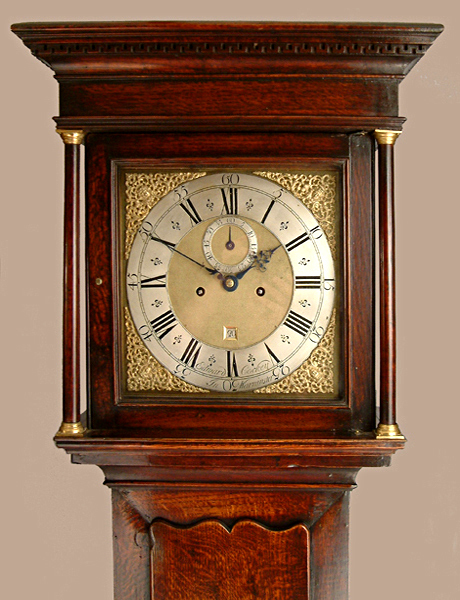 Edward Cockey of Warminster Longcase Oak Mid 18thC - Height 81.5in. This Longcase Oak Archive's Maker - Edward Cockey is recorded baptised at Warminster 17th September 1669, working for his father by 1692, in church records as "Clockmaker" in 1708 and died 1768.By 1705 he had begun a long standing relationship with the owners and clocks of Longleat the most famous of which is the astronomical clock in the Great Hall bought by Lord Weymouth in 1707.A further astronomical clock was given to Queen Anne for her drawing room at St. James's Palace at about the same time.I assume that the latter was an expensive gift from Lord Weymouth. Edward also enjoyed the patronage of the Lutrell family of Dunster Castle and Lord Carrington of Wycombe Abbey. Edward junior did not, apparently follow his father into clockmaking becoming, instead, a wine merchant. A good, well proportioned, long door, flat top, oak case of rich colour and patination having simple greek key pattern decoration under the hood cornice. The mitred front case construction and hood back splats typical of the maker, and regional characteristics of the period. 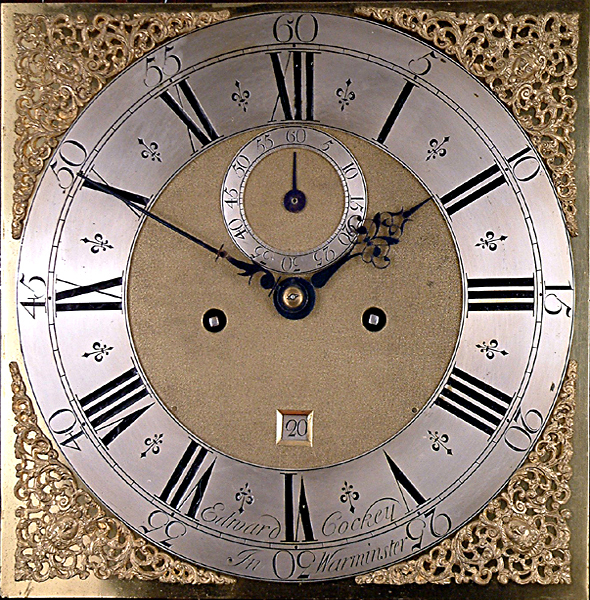 12" square brass dial with finely matted dial centre, subsidiary seconds dial, "floating" half hour markers to chapter ring, "Indian head" spandrels and square box date aperture above the six o'clock position.Blued cut steel hands. Good quality 8 day movement with 5 knopped pillars.Hourly ( rack ) striking. Edward Cockey is recorded baptised at Warminster 17th September 1669, working for his father by 1692, in church records as "Clockmaker" in 1708 and died 1768.By 1705 he had begun a long standing relationship with the owners and clocks of Longleat the most famous of which is the astronomical clock in the Great Hall bought by Lord Weymouth in 1707.A further astronomical clock was given to Queen Anne for her drawing room at St. James's Palace at about the same time.I assume that the latter was an expensive gift from Lord Weymouth. Edward also enjoyed the patronage of the Lutrell family of Dunster Castle and Lord Carrington of Wycombe Abbey. Edward junior did not, apparently follow his father into clockmaking becoming, instead, a wine merchant. Mid 18thC.Dating by style circa 1745.